I had seen Croissants at Nisa Homey’s place and was amazed, flabbergasted!! 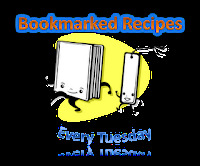 My fellow bloggers are amazing, creative artists they can change adversity to an advantage! Nisa Homey encouraged me to try making these beauties. As I generally avoid using Maida I tried making these out of whole wheat but I was not too happy with the result. But Kid 2 loved them and asked me to make them again. Today in the morning I discovered that I had left 2 litres milk out on the kitchen platform and so I ended up with 250grams of Paneer. So today I when I made Croissants I made them with Maida and I salute your superior knowledge Nisa Homey. They are best made in Maida. I am hooked to bread making now. 1. Blend the paneer, yeast, salt, sugar, oil using the lukewarm water. Since my mixer loves making a mess when I load it a little more liquid I used water sparingly. 2. Mix the rest of the water in the yeast mix. In the flour add the grated garlic, coriander and oregano and mix well. Make a well in the centre of the flour mix pour the yeast mix and knead with your hands to make smooth dough. Cover with a wet cloth. 3. Let it rest for 1-1 ½ hours or till it doubles in size. 4. 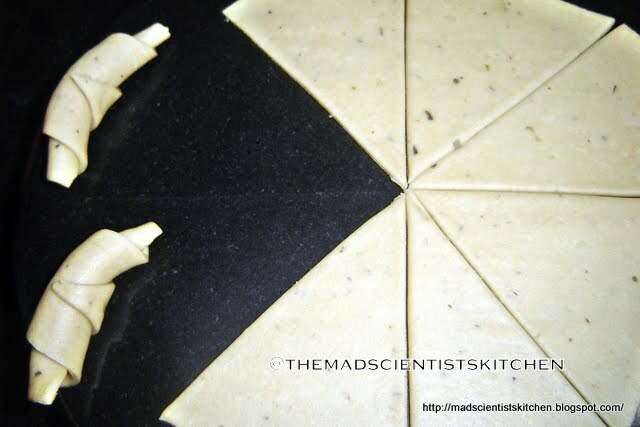 Divide the dough in two parts. Roll one part into a circle and cut 8 triangles. 5. Start rolling with your finger tips the bigger side to the centre of the circle. This photograph is from my earlier try and only to indicate the way it needs to be done. 6. Place in a greased tray and let them sit for ½ an hour. 7. Preheat the oven to 180°C or 325°F (325 F is not exactly 180 it is about 176. Something). 8. 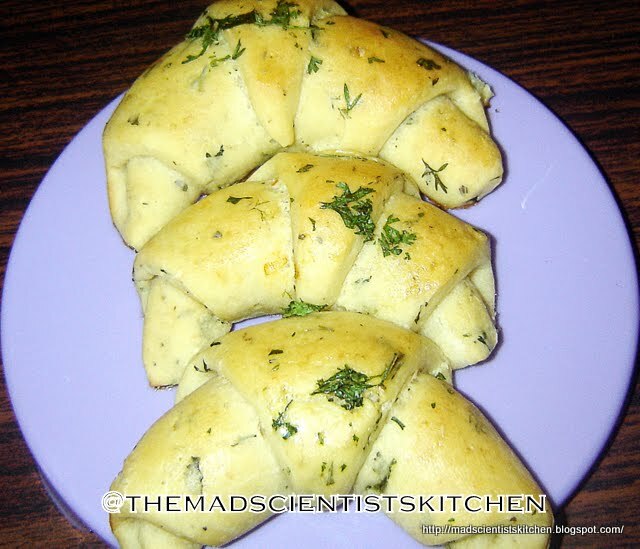 Brush the crescents with egg and some coriander, and oregano. 9. Place the tray in the heated oven and bake for 25 minutes. I needed 25 you may need lesser time depending on the oven. Bake golden. Sending this also to Aipi's and Priya's Bookmarked recipes. 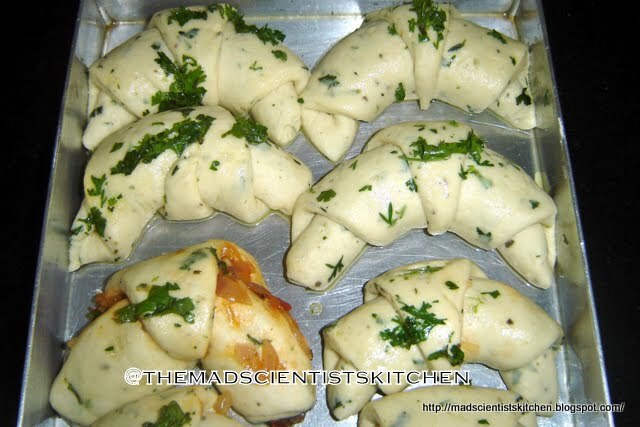 Just now I kept some croissants in the oven, I should have added some paneer too. This looks too delicious. I bet that was super yummy.. Thanks a bundle!! I am thrilled to hear from the few of the best bakers. 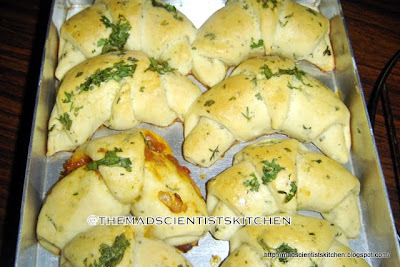 Paneer crossants looks so perfect and absolutely delicious !! Wow, So yummy, just the idea is making my mouth water! Beautifully done... nicely rolled.. perfect croissants..
yummm yummm....croissants and with a paneer filling looks so delicious. These looks absolutely gorgeous... Yummy croissants..
Omg, those crossiants makes me drool, feel like grabbing..
Croissants look yummy and colorful. Simply irresistible yummy stuffed croissants. wow...I adore this Archana..looks delicious..
croissants look absolutely delicious and yummy ! Wow perfecrtly baked and yum! Luks so beautifulw...happ to c ur kids liked it.. Thanks all. The credit goes to both Aipi and Nisa they were the ones who encouraged me to try bread making! Pani Pooris or Gol Gappas! !